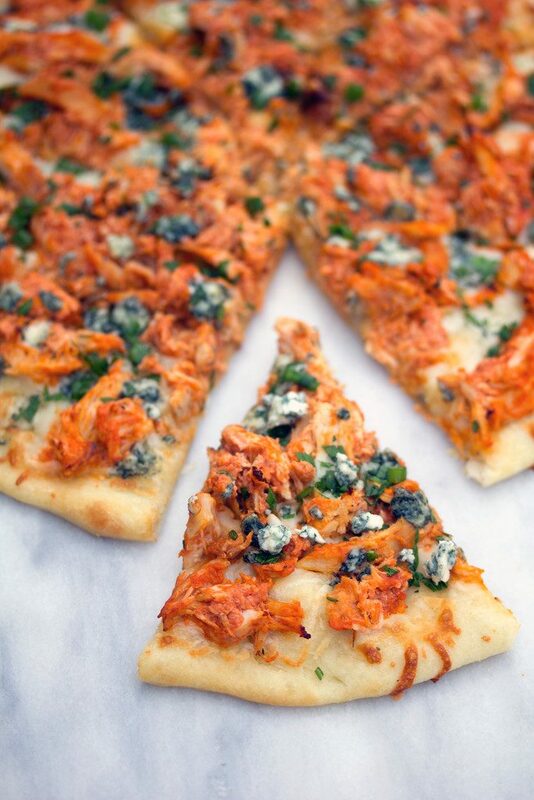 If you love buffalo chicken and can’t get enough pizza, you will be obsessed with this Buffalo Chicken Pizza. Make it with a rotisserie chicken for an incredibly easy weeknight dinner! I hate to complain about Mondays. I really, really do. But man, this one is going to be tough. I haven’t been in the office in almost two whole entire weeks. TWO WEEKS at home. Sleeping in. Cooking. Baking. Catching up on bad TV. Reading. Spending time with my family. Cleaning. Writing. Taking baths. Sitting on my couch… (OK, I had to work from home a bit, but still. HOME). It has been heavenly. But all good things must come to an end and it wouldn’t be vacation if it lasted forever, would it? So, now I’m back to the grind. There are two things getting me through the day. 1) Tonight’s season premiere of The Bachelor! and 2) Tonight’s tacos. With my eye on the prize, I can do this. And so can you! One of my big goals for the year is to be better at meal planning during the week on a more consistent basis. If I know what I’m going to make for dinner at the start of the week, the chances of me actually cooking after work greatly improve. But my first Monday back to work is not the night to start anything crazy. So, I’m celebrating The Bachelor with easy-to-make (and wonderfully delicious) tacos. 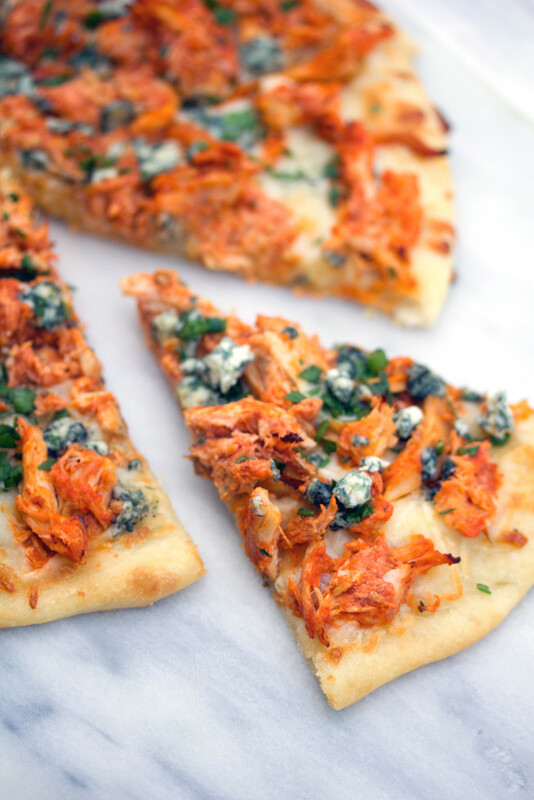 And sharing this recipe for super easy Buffalo Chicken Pizza with you. Let’s ease into this whole beginning of the year thing, shall we? You might see the below and think that I cheated when it comes to making buffalo chicken pizza… But I will argue that rotisserie chicken is a serious lifesaver for a working woman (or man). Of course, you can cook a whole chicken yourself for this or use chicken breasts or thighs. It’s all about whatever you have time for! And a rotisserie chicken makes things mighty easy! I recommend using my trusty pizza/flatbread dough. You can make it ahead of time, so you’re ready to roll (literally) when you get home from work. Or you can even buy dough from your grocery store. Seriously, make it easy for yourself. Rolling the dough out is the toughest part of this recipe. Again, you can call me a cheater, but all I did was shred the meat from the rotisserie chicken and combine it with Frank’s Red Hot. Then I brushed the dough with olive oil and sprinkled it with mozzarella cheese. Topped it with the chicken. And then crumbled blue cheese all around. In an oven pre-heated at 450 degrees, I baked the pizza for 10-14 minutes, until the crust was nice and crispy and starting to brown. Gimmie gimmie. 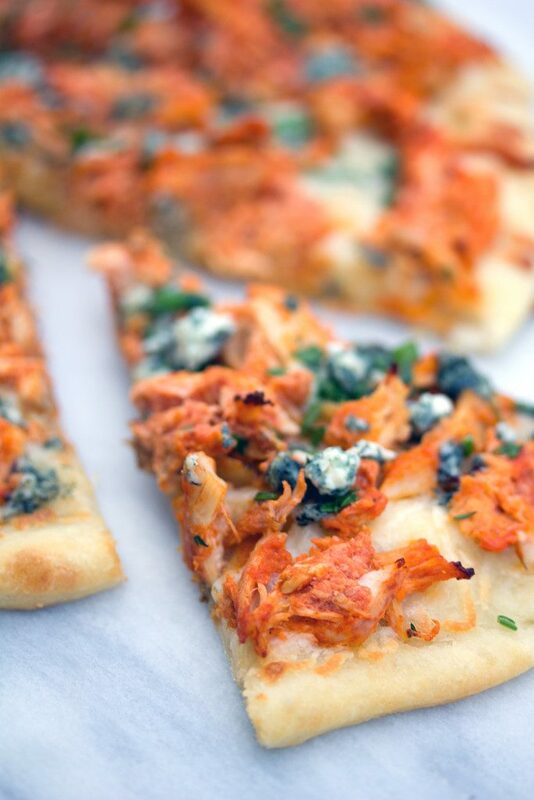 Buffalo Chicken Pizza in a flash. You should also know that for some reason, I’m generally pretty anti chicken on pizza. Give me pepperoni and and prosciutto and sausage and even hamburger. Chicken bores me. But not with this buffalo chicken pizza. I’m sure it’s all because of that hot sauce. Plus, any excuse I have to put blue cheese on pizza is a good one. Are you with me? But really, the point is, you can have this dinner on your table in no time at all. It seems like the harder my work day is, the more I crave sitting down to a really satisfying dinner. But the less I want to stand on my feet and make that dinner when I get home. This is the perfect solution. After writing this post, I literally just added buffalo chicken pizza to my meal plan again for next week. Woo hoo, I’m already staying on top of my resolutions! What’s your favorite meal to enjoy when returning back to the real world from a long luxurious holiday? Bachelor and tacos. Bachelor and tacos. If you’re looking for another delicious buffalo chicken recipe mash, check out my recipe for Buffalo Chicken Grilled Cheese and Instant Pot Buffalo Chicken Pizza. 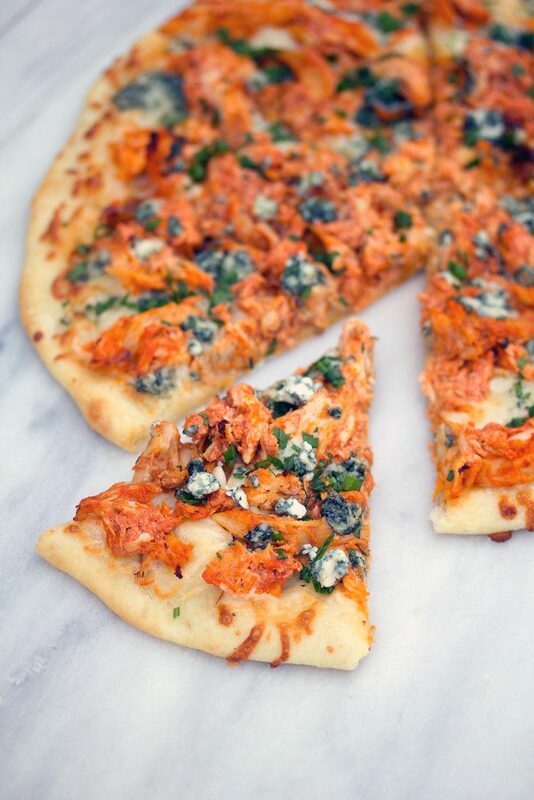 If you love buffalo chicken and can't get enough pizza, you will be obsessed with this Buffalo Chicken Pizza. Make it with a rotisserie chicken for an incredibly easy weeknight dinner! On a well-floured surface, roll out flatbread dough into a 13-inch round. 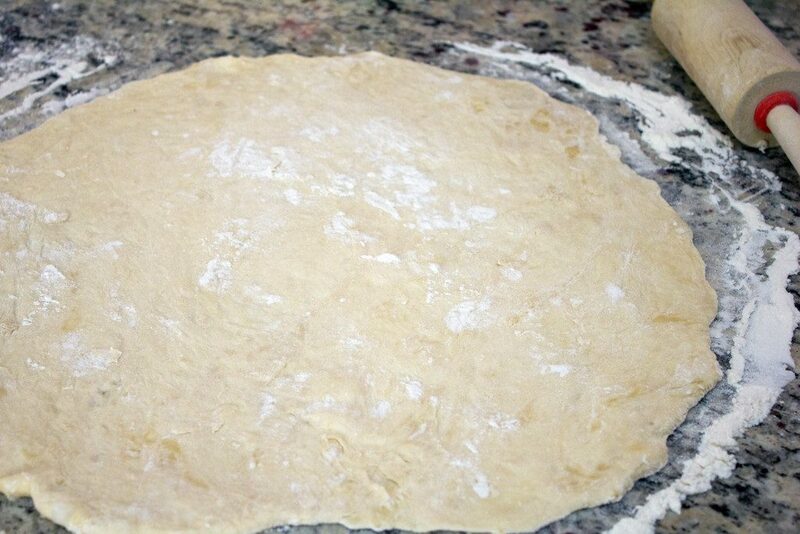 Place dough round onto a pizza stone or pizza pan covered in aluminum foil. 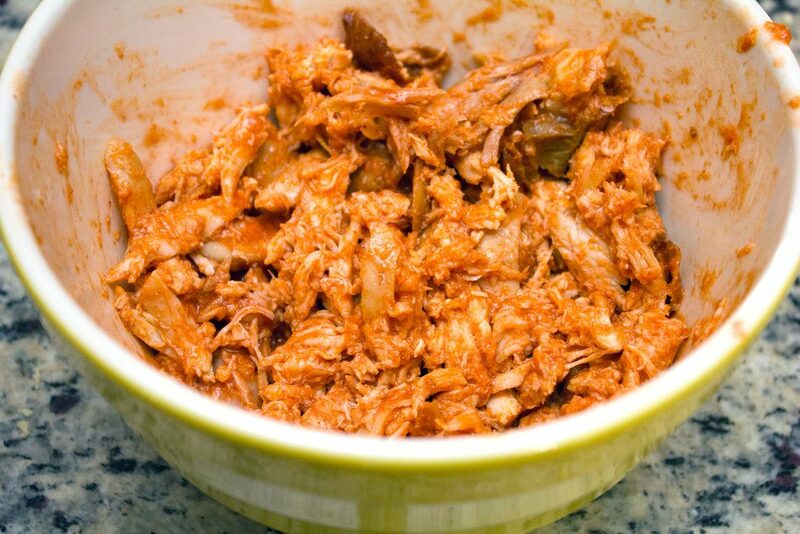 In a medium bowl, combine shredded rotisserie chicken and Frank's Red Hot until chicken is well coated. Lightly brush the dough round with olive oil. 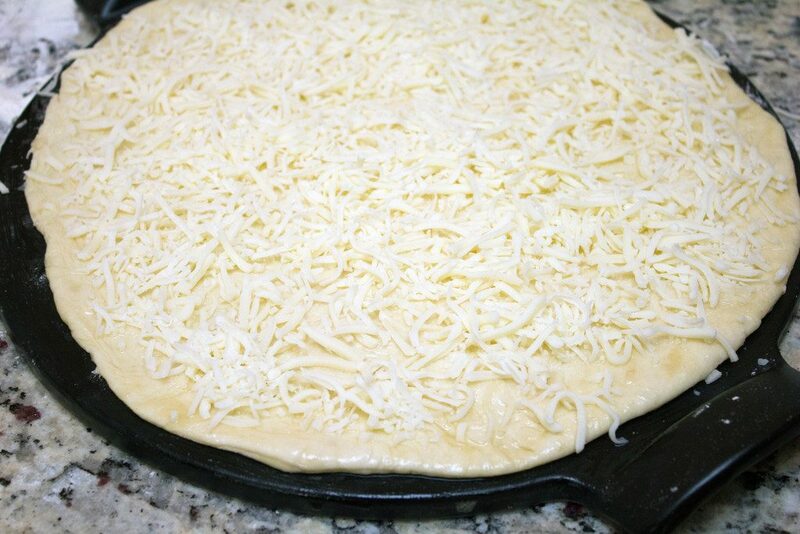 Sprinkle mozzarella cheese around dough. Crumble blue cheese on top of pizza. Bake at 450 degrees for 10-14 minutes, until crust is browning and crispy. Top pizza with chopped parsleys and chives before serving. I recommend this recipe for homemade pizza dough. 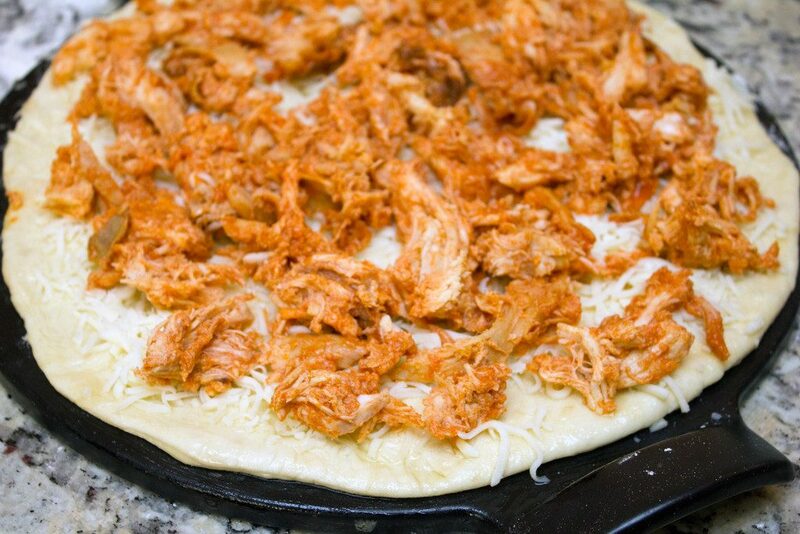 30 Responses to "Easy Buffalo Chicken Pizza"
I agree that it’s pretty rough going back to the real world today! This looks incredible. I just bought a brand new giant bottle of Frank’s and I have a feeling this easy pizza is going to be in my future soon. 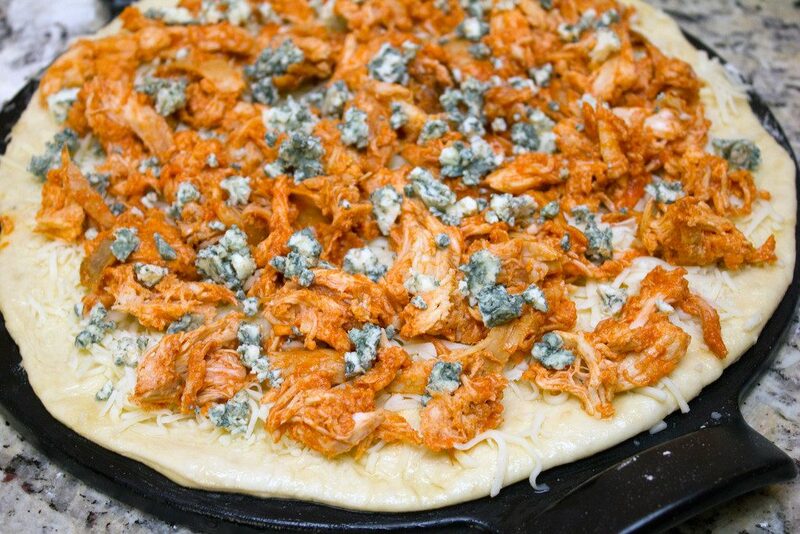 Buffalo chicken pizza is one of my favorite kinds! I love how easy this is to whip up. Perfect for a week night meal! never underestimate the power of the rotis!! such a life saver! and speaking of roasting chicken, i have one in my fridge that needs to be cooked up, so perhaps I’ll do that and then break it down to make this! yum! So excited for The Bachelor! And this pizza looks like great football food. Maybe I can squeeze in making it before the season is over! I’m jealous of your time off! This pizza looks pretty amazing. Hope your Monday was a good one! Oooh yes, today was rough. I wish I had this pizza for dinner!! Buffalo chicken is such a weakness of mine, and I love taking the rotisserie chicken short cut. Better meal planning is on my list for 2015, too, and I think I better add this one! Love your countertops! What material are they? I should not have look at this because now I am going to be craving this pizza all day. I’ll take a slice, please! Yes, buffalo chicken and blue cheese on pizza!! I’m in! 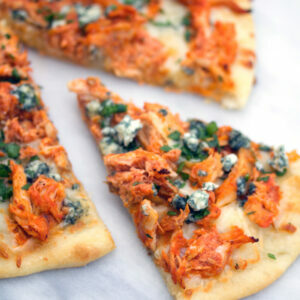 I’ve done buffalo chicken pizza before but not with blue cheese, now I have to! Great recipe! 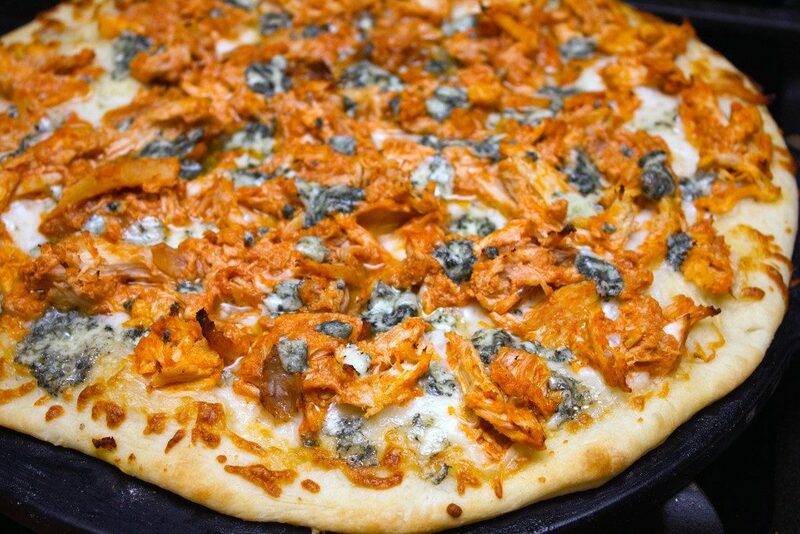 I’ve never tried buffalo chicken pizza before, but I’m missing out because this looks seriously delicious. Bookmarking to try real soon! Thanks for sharing your lovely recipe. @Angela- Thank you! They’re granite. They were in our house when we bought it and I’m very grateful that I like them, too! that is easy and I love easy food and delicious food. 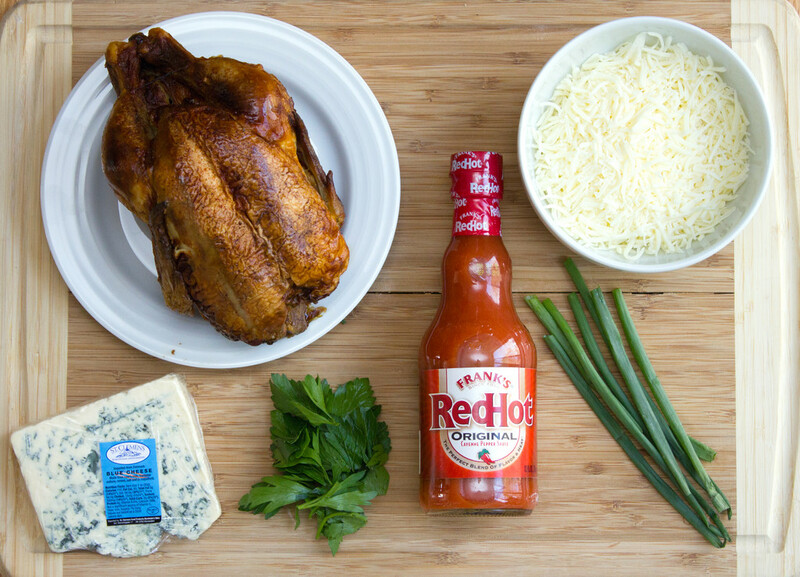 The buffalo sauce sounds fantastic and what a great thing to serve for the super bowl! Love, love, love blue cheese! This looks amazing! Buffalo sauce and Bleu Cheese are a always a winning combo in my book! My family would love this! Nice pizza, I like the idea of the hot sauce and the blue cheese…yum! Nothing like simple and tasty recipes! Buffalo-style-anything is my favorite, especially pizza. I can’t wait to give this recipe a try. Thanks! You know, I feel like my week would have been off to a MUCH better start if it had had this in it! Mmmmm. Now that is my kind of pizza! That is one delicious looking pizza! Monday was rough here two! I had two teenagers that in no way wanted to go to school. Well now its back to the normal routine. Happy new year! Look at that color! Just the thought of this makes my mouth water! I don’t know what it is about buffalo chicken and blue cheese that makes me so happy. I love that flavor combo. Even better on pizza! I’d have no problem eating the entire pie! My god, that looks delicious! !